Well, this is a first - I have no idea how to begin a review. I have no idea how I want to kick things off, because I was just shellshocked - flabbergasted, really - after reading Requiem. I in no way did I expect that ending. I remember blinking rapidly, and just whispering "Ohmygod. That's it?" to nothingness (I'm not being overly dramatic, okay, I was alone, for one), and I remember sending out a semi-hysterical tweet. If I were to base my rating on my initial reaction, I'd probably be giving Requiem around two to three stars, but I forced myself to wait a few days before penning my review. I wanted to let the events that happened throughout the final book sink in, and I'm glad I did. The thing is, I understand why some people were disappointed with how Requiem ended, and I can't blame them for feeling that way. While I consider myself a huge fan of open endings, a part of me still feels that that the way this trilogy ended is too vague. Readers will always want answers, a definitive ending, and an idea on how the characters will fare after the final page of the novel, but we don't exactly get that with Requiem. The final pages of the novel - while beautifully written, as Oliver truly has a way with words - still felt a bit rushed, and I remember feeling apprehensive when I realized that there were barely any pages left and yet the story didn't feel finished. However, I soon realized that gripping stories don't really end per se - we only witness a few chapters of a character's life throughout a particular novel or series after all, don't we? Though we can't help but feel like we've been part of Lena's life all throughout, we weren't - our journey with Lena started when she began to value the concept of freedom and realized that love isn't a myth. We weren't with her before that. With this thought in mind, Oliver did end this particular chapter of Lena's life, and gave us a glimpse of what's to come for her. The ending may not be thoroughly detailed, sure, but it's still an ending,and I thank Oliver for giving me that. 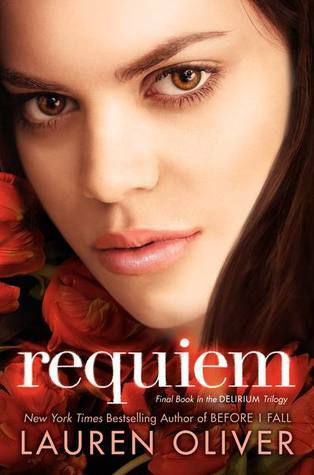 Despite all the hoopla with the ending, I enjoyed reading Requiem. Requiem picks up where Pandemonium left off - Lena managed to rescue Julian with the help of the Resistance, and she now calls the Wilds her home. However, Alex's return throws Lena off, and she now must decide who she truly loves between Alex and Julian. This isn't your typical love-triangle set-up though - first and foremost, Alex is obviously scarred by the events after his arrest, and he's not exactly paying attention to Lena. Julian, meanwhile, is doing all that he can to show Lena his love. Also, unlike Delirium and Pandemonium, in Requiem, the romance takes a backseat to the Resistance's efforts to overthrow the current government, and it took a bit of getting used to. While reading this novel, it was so apparent to me who Lena truly loved. The way she acted around him, the way she always thought about him, the way his every action - every single thing he did - affected her... It was just obvious to me that there was only one guy who Lena wanted, and needed, in her life. Moreover, he also showcases his undying love for her in a particular scene (I wish I could tell you guys which, but alas, this should remain a spoiler-free review). I loved how Oliver had their story unfold in this novel - the two's journey wasn't all fun and rainbows, and while we don't exactly find out whether the two have a definite happy ending, Lena's choice made sense to me, and I was ultimately satisfied with it. The dual POVs enriched the story-telling too. While a part of me would have preferred that Lena tell the entire story, the chapters chronicled by Hana were gripping, to say the least. It was interesting to see how related events unfolded through Lena's - who was a vital member of the Resistance, and Hana's - who was marrying the mayor - eyes. Moreover, I particularly enjoyed reading through Hana's chapters for they proved to me how powerful some emotions are. My feelings for Requiem as a whole are complicated. I enjoyed the main plotline, the character development, the dual POVs, and the beautifully written final chapter. However, like most of you, a part of me still yearns for something more. I wish we could have been given more. I'd love to be able to read about Lena a few months after the events of Requiem, just to know how she is faring. I'd love an epilogue. I just can't help but feel sad that my part in Lena's story has ended, and yet I feel like there are still plenty left for me to discover. Nonetheless, the Delirium trilogy remains to be a favorite of mine, and I urge everyone to read these novels. Oh crap. I hear everybody about the ending and if there is something I can't stand.. it's the feeling of wanting more. I hope to read Pandemonium somewhere this year, so I didn't read your complete review. Yeah I keep hearing about this open ended ending Oliver had. That gives me pause. Open ended endings just seems kinda... lazy (?) to me. Like it can end with a definite ending with it being an open ended ending (woah... I said end/ending *way* too much there). I wasn't planning on finishing the trilogy after Pandemonium because I really am not in the mood for a love triangle. Glad to hear the romance took a backseat.